Are you stuck for stocking filler and Christmas gift ideas? Looking for something small and a bit special for a loved one? Left your secret Santa present buying to the last minute and no clue what to get? Or forgotten that family party and need a token gift for a relative? Read on for Arctic Fashion's stocking filler ideas or click here to view Arctic Fashion's small gifts collection. All these items are available to buy online now and if you order before 18th December, we will make sure your order reaches you in time for Christmas. A fun and practical solution to rescue towels from the floor! These stylish towel clips can be used in your bathroom, kitchen or bedroom. Simple to fasten, they allow you to hang towels and tea cloths securely from hooks. Despite the name, towel clips are not exclusively for towels and have other innovative uses. You can use them to keep pairs of socks and gloves together. Hang your gloves on the coat stand or by the front door so you can retrieve them quickly as you are heading out the door. Choose from bright flower-shaped Kukka, the more masculine moose-shaped Hirvonen or bird-shaped Lintunen towel clips. Arctic Fashion now stock towel clips for kids with little girl Helena, little boy Muksu, smiley face Heikki and baby Napero themed items for children. Each of these designer towel clips is made from sustainable wood, making it eco-friendly and long lasting. A personal gift for everyone! Wooden key rings make great stocking fillers. As well as keeping keys safely together, they come in three different designs to suit all personalities. Well crafted from sustainable wood, all our key rings are eco-friendly, durable and lightweight - perfect for everyday use. 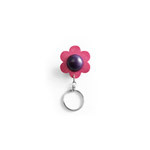 The colourful, flower-shaped Kukka key ring will brighten up her day. Choose her favourite colour combination from mixed blue, mixed red or mixed green. 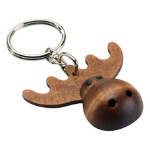 The Hirvonen moose key ring is one of Aarikka's popular, original designs. It makes a good stocking filler for nature lovers you know or the boys and men in your life. The chunky moose-shaped key fob is large enough to make a statement, but small enough to fit in their jacket pocket. Another typically Finnish design, the Päkä ram key ring is a symbol of strength and determination. Available in two bright colours, you can choose from orange or green. Ideal for nature lovers, Aries star signs or those with ram-like personality traits! Add a touch of personality to their mobile handset. Mobile phone charms are small, quirky and perfect as stocking fillers. 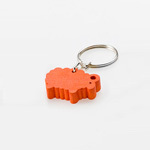 Like key rings, they are an easy way of personalising everyday items. 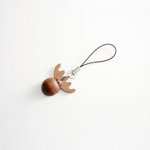 The Hirvonen affable moose design also comes as a mobile phone charm, adding Finnish charm to their mobile handset. 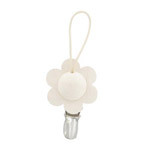 A lightweight stocking filler, this mobile phone charm is fashion without the fuss. Flower power for their mobile! 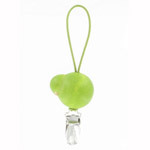 This new Kukka mobile phone charm comes in yellow/orange and green/blue. 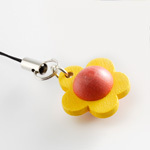 Made from sustainable wood, the flower-shaped charm makes a Secret Santa gift for girlie girls or stocking filler for daughters, granddaughters, neices and little sisters. An easy way to individualise their handbag. Light and stylish, bag decorations are a quick way of accessorizing their favourite handbag. Simply clip on the strap or buckle and off they go. The Kaisli bag charm comes in two colour combinations - red and black. The red and natural wood design complements brown and tan bags whereas the black Kaisli decoration matches black suede or leather purses. 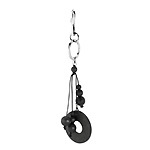 The Rumba bag charm will make a striking addition to their hand bag. 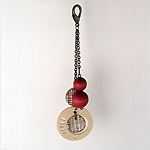 It has a single wooden loop and strings of wooden beads with a metal clip. Choose their favourite from a pure black or a mixed brown and gold colour combination. 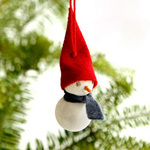 Santa's elf ornaments are fun, festive and eco-friendly. From the tiny Tonttulapsi baby tonttu to the large Tonttumuori Mrs Santa tonttu, these collectable tonttus come in a variety of shapes and sizes. With so many to choose from, you are bound to find the perfect one for them. You can share the magic of Christmas with family and friends by giving these special tonttus as stocking fillers. 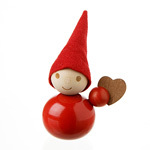 Each one has been beautifully crafted by specialist Finnish artisans in Santa's homeland. Christmas tree decorations are lovely stocking fillers and Secret Santa present for everyone from close family and friends to less well known colleagues and relatives. Arctic Fashion stocks a range of angel, snowman, Santa's elf and bell shaped Christmas tree decorations, which make a refreshing alternative to glass baubles. These high quality tree decorations are crafted from sustainable wood and are something they can treasure and enjoy year after year.